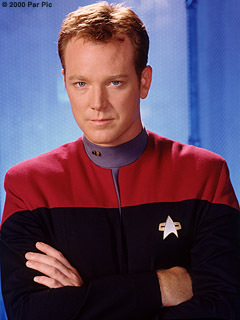 Lt. Tom Paris, played by Robert Duncan McNeill, is the Chief Helmsman on Voyager. He is the son of Admiral Owen Paris. Tom has two sisters, and no children. When he was a Cadet at Starfleet Academy he covered up the details of an accident that claimed the lives of three other Cadets, including his own girlfriend. When he came forward he was expelled. He later joined up with Chakotay's Maquis group only to be caught and imprisoned two weeks later. That is where Captain Janeway found him - in a penal colony in New Zeland. She asked him to assist her in the Badlands as an observer. Tom has since worked hard as a bridge officer to earn the respect and acceptance of the crew. He has saved the ship countless times with his creative flying. Tom is, in his own words, "The best damn pilot you can find!" 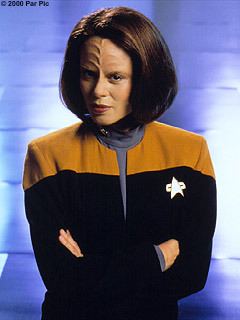 Lt. B'Elanna Torres, played by Roxann Dawson, is Voyager's Chief Engineer. She is a Klingon/Human hybrid who grew up on Kessik IV. B'Elanna's human father left the family when she was 5 years old. She was raised by her Klingon mother, who pushed her to conform to Klingon ways despite that fact that they were probably the only Klingon's on the entire planet. She struggles with the Klingon side of herself almost constantly. B'Elanna dropped out of Starfleet Academy in her second year and joined Chakotay's Maquis group as an engineer. She has since intregrated into Voyager's crew, and her engineering brilliance has saved the lives of her new-found family on more occasions than anyone can count.